Los Angeles County Search and Rescue workers have recruited bystanders to gather wood to shore up the dig. Port-au-Prince, Haiti (CNN) -- A team with Los Angeles County Search and Rescue answered Saturday the desperate but futile pleas of a mother who believed her young daughter was trapped alive beneath the rubble of a day care center in downtown Port-au-Prince. Search and rescue personnel determined there was no one still alive inside the structure and left the site. The mother had stood praying silently while watching the rescue efforts, four days after a magnitude 7.0 quake devastated the impoverished island nation. She remained there as the rescue personnel pulled away, still holding onto the hope her daughter was alive. Despite the heartbreak, there were a few bright spots on a day when hopes were dimming for possible survivors still buried. One man was pulled from the rubble Saturday, according to U.S. Secretary of State Hillary Clinton, who was visiting the quake-battered capital Saturday. "We are grateful for that rescue," she said. Elsewhere in the capital, two rescue crews from Miami-Dade County, Florida, and Los Angeles County said they were responding to a text message from a 30-year-old woman beneath the ruins of the collapsed bank where she worked. Dogs have picked up the scent of survivors within the rubble several times, but so far the rescue crews haven't seen or heard anything with high-tech cameras and listening devices. 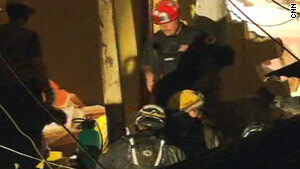 Another woman is also believed to be alive under the building, the rescue crews said. The rescue personnel were working through the night to reach them. Meanwhile, an urban rescue team from the New York police and fire departments was attempting to free five people trapped in the rubble of a grocery story in Port-au-Prince. The rescue began Saturday evening after individuals alerted a member of the team to the situation, according to a statement from New York Police Department spokesman Paul J. Browne. The five have been in verbal communication with the 16-member team and say they have been surviving on food and water that was in the store, the statement said. American officials said search and rescue operations will continue through the weekend.